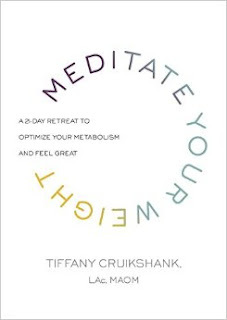 Each day of the plan in Meditate Your Weight helps you explore and release what's weighing you down physically, emotionally, and mentally—the mental blocks, thoughts, habits, and behaviors that stand in your way—to make it easier to think more clearly, make better choices, and maximize metabolism. As you lighten up on the inside, you’ll lighten up on the outside. Less stress=less belly fat. More calm + more balance = a healthier you. I enjoyed this Book. I found it helpful and moving. The book did lead to me having less stress. But I found that most of this book was just yoga posses. For me I was hoping there would be more stuff about meditating and more ways to get over stress. Over all this book did help and feel that it's a great starting point for anyone who's looking for a way to loss stress, start meditating and doing yoga.